The Miyatojima Tsukihama area is a small village surrounded by intricate terrain. 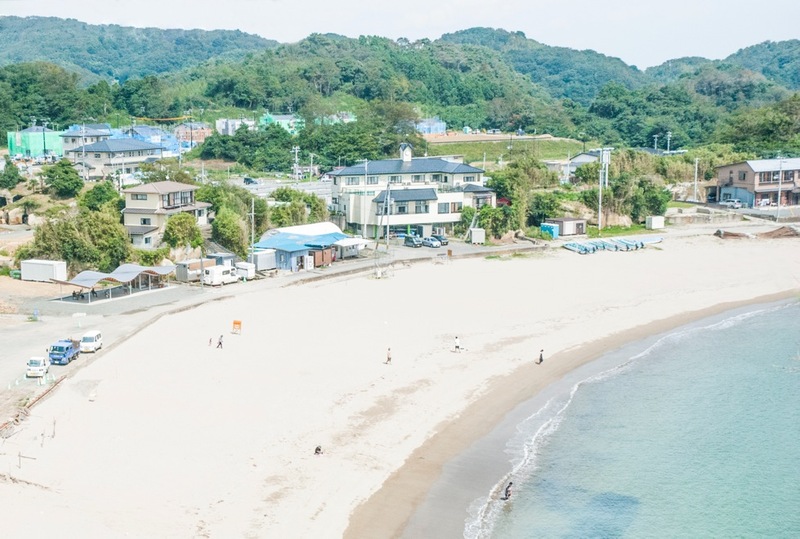 In the Tsukihama there are beautiful sandy beaches with many inns for visitors coming to the area for sightseeing and to enjoy the local nature, or while working in fisheries harvesting nori and abalone. After the earthquake and subsequent tsunami the Tsukihama beach resort in Miyatokjima was reopened, however many of the inns were destroyed. It was therefore difficult to re-attract the visitors who had flocked to the area before the disaster and so the fishing industry became the focus for the area's rehabilitation. There was no space to build a main centre for the fishermen and a place for visitors to rest. Therefore , this HOME-FOR-ALL was built as a starting point for the recovery of the Tsukihama area. The architects proposed a light roof, full of movement that could be used for a variety of things: as a resting place for visitors, as a fisherman's workplace and and as a daily market-place. The workshop has a very open structure meaning that it is very easy for fishermen to get access with both cars and boats. By keeping the roof low, in harmony with the surrounding environment, the cold northernly winds in the winter will be less harsh and in the hot summer a cool breeze can filter through. The hope is that this HOME-FOR-ALL can act as a catalyst to boost this area, once again, as a must-visit destination. Please contact to HOME-FOR-ALL in advance, if you are going to visit this house.